Duration is a case of a “transition,” of a “change,” a becoming, but it is a becoming that endures, a change that is substance itself. Puddles mean disaster. The roof leaked! The dike burst! Puddles of blood! The yellow puddle left by the dog! Oil pooled under the car! Spilled milk! A can of red paint spilled onto a beautiful wood floor and there will be hell to pay! But Rainer Splitt didn’t spill this paint, he poured it. The verb makes all the difference. And if he poured it, then perhaps pool is a better word than puddle. The noun makes a difference as well. Part of a private collection in München, this work is catalogued on the artist’s website as Farbguss (Rubin) 2009; Pigment, PUR, 64 kg. And with the kilograms (not centimeters?) the questions flood in. Ideas begin to flow. Had these 64 kilograms of color been poured in any other place, they would have found a different form. The walls of this corner dictate two straight lines. The rectangular wall thrusts its ninety-degree angles into the liquid. The bright orange-brown of the wood floor and of the molding frame the ruby pool. The amount of the liquid, its viscosity, and its surface tension determined how far from the wall it spread. When sculptors pour liquid into a mold, the casting results in an object soon isolated from the process. Splitt’s colorpour is interesting precisely because it was poured. The mold, both where it stands and where it opens up to allow the liquid to spread, is part of the work. Influenced both by viscosity and by surface tension, the rounded edge has the form of fluidity. It is all but impossible to look at the quarter-round without thinking of the movement that created it. The pool is different from most pools because it is gathered above the flat floor, as opposed to having flowed down into a dip or depression. It has the form of motion as opposed to the form that characterizes most statues—the form of erection, of standing (the *sta- root of the words statue and Standbild means “to stand”). Because it is flat, and because of the nature of its polyurethane/pigment mixture, the pool is also reflective. Depending on the viewer’s perspective, the room around the pool becomes part of the work and the work becomes part of the room. 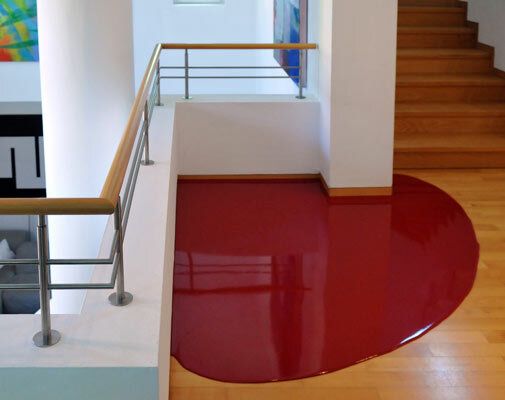 Every artwork does this to some extent, but the position on the floor and the reflective surface of the colorpool highlight the reciprocal connection. The slightly distorted reflection of the railing, for instance, both reimagines the railing and indicates that the pool is not, in fact, absolutely flat. Exhibited in a space overlooking a high-ceilinged room with abstract paintings on its walls, the ruby colorpool points (yes, points—another aspect of its corner position) at another work below: a white-on-black painting partially obstructed by a white column. Instantly recognizable as one of Julije Knifer’s meanders, the painting is, like the colorpool, a study in the motion of form, a study in the form of motion. Knifer called these obsessively repeated and varied forms meanders. The word “meander” is both a verb and a noun: a meander exists in space, to meander is to move through space and thus through time. The painting here strikes me as both noun and verb. Knifer’s meanders are forms fixed on paper or canvas that move from left to right or from right to left in sometimes regular, sometimes syncopated geometrical rhythms. I once described my experience with several of the meanders as “seeing jazz” (Zarko Radakovic editor: Julije Knifer (Stuttgart: Flugasche 1990)). And now I can’t resist saying that an experience with Splitt’s colorpool is like watching paint dry. Who knew what a thrill that can be! This entry was posted in Uncategorized and tagged colorpour, Farbguss, Gilles Deleuze, Henri Bergson, Julije Knifer, Rainer Splitt. Bookmark the permalink.